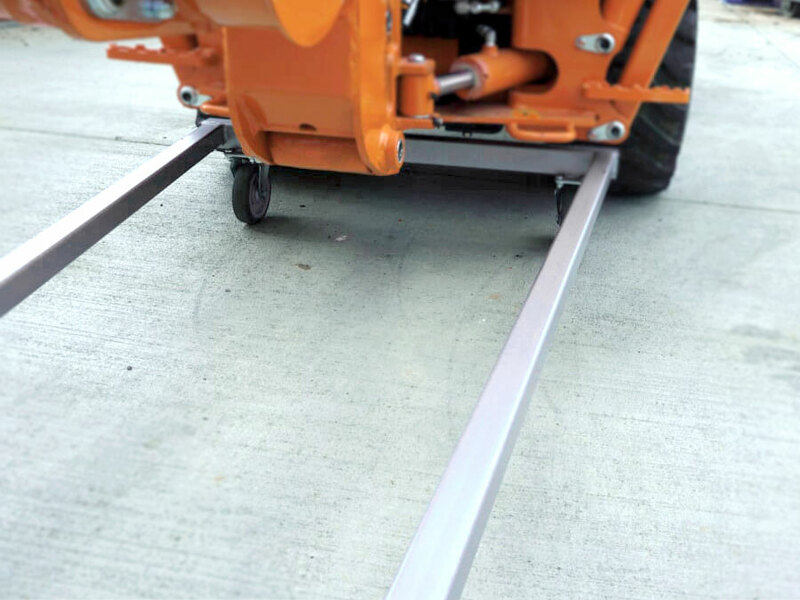 The BXpanded Backhoe Dolly is designed as a safe and convenient way to remove, store and re-install the BT603, BT602, BT601 or BT600 Backhoe. It makes the removal and re-installation very simple and quick. 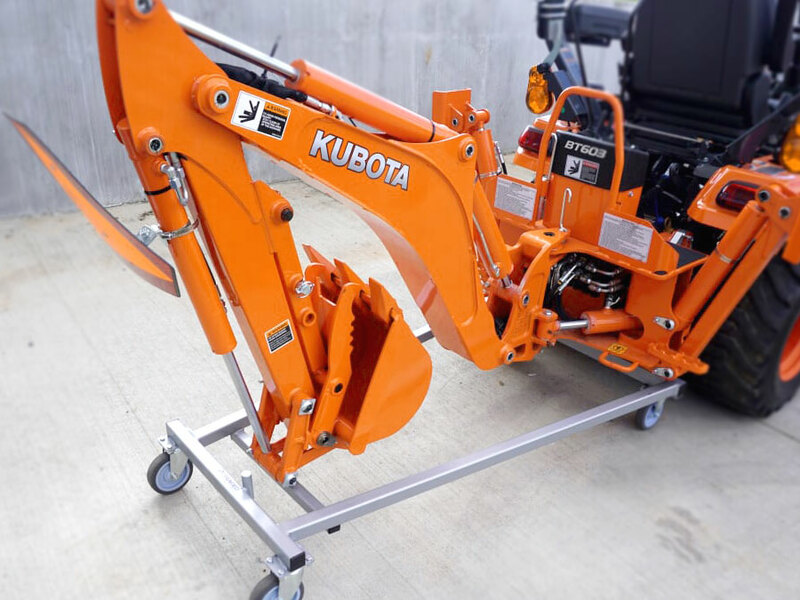 Its design allows the backhoe to be removed and safely stored in its most compact configuration with the boom, dipper stick, bucket and stabilizers completely retracted. The configuration of the dolly prevents the backhoe from slipping or shifting. 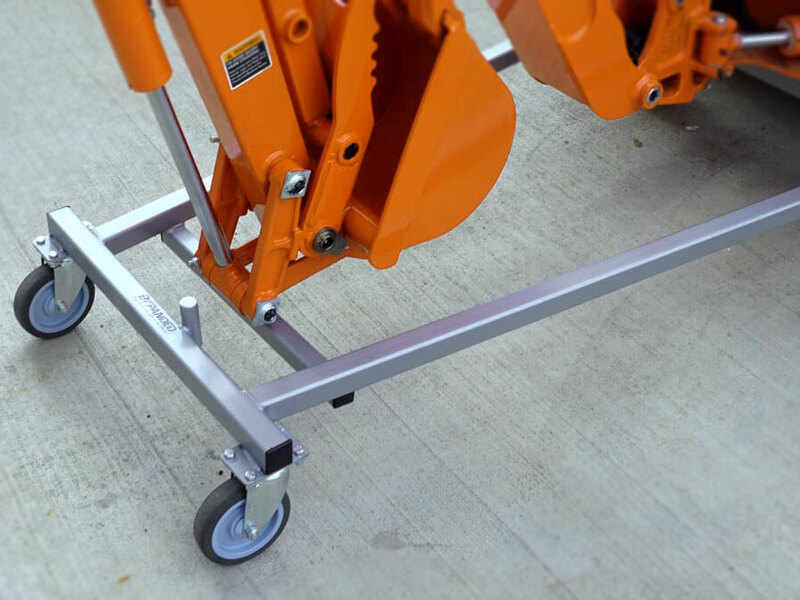 The dolly is constructed of welded, structural square tubing for light weight and strength. Casters have rubber tires to allow easy rolling on rough or littered floors. The dolly is finished with a durable, hammered finish, silver paint. Initial assembly consists of bolting the casters in place. All other joints are welded. 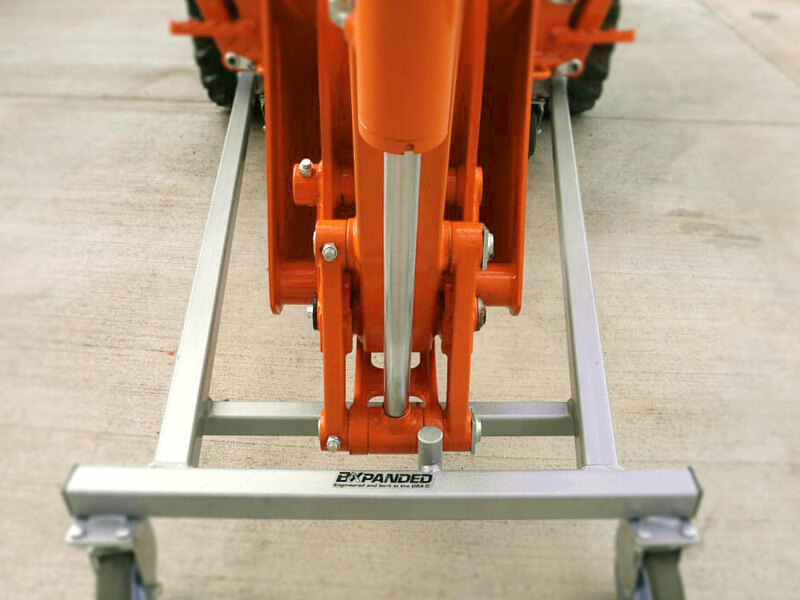 Like most other BXpanded products, the Backhoe Dolly is compact and light enough to store easily when not in use. Be sure to check out the BXpanded Front Loader Dolly also. Also available for BT600, click here to review special instructions before purchase. Well made and easy to put together - just mount the casters and you're ready to store your backhoe on any hard surfaced area. Due to limited space in my shed, the dolly was a must to be able to get my tractor, loader and BH stored inside when off. Just one note for anyone storing the BH in a confined area. Two of the casters swivel and two are fixed. 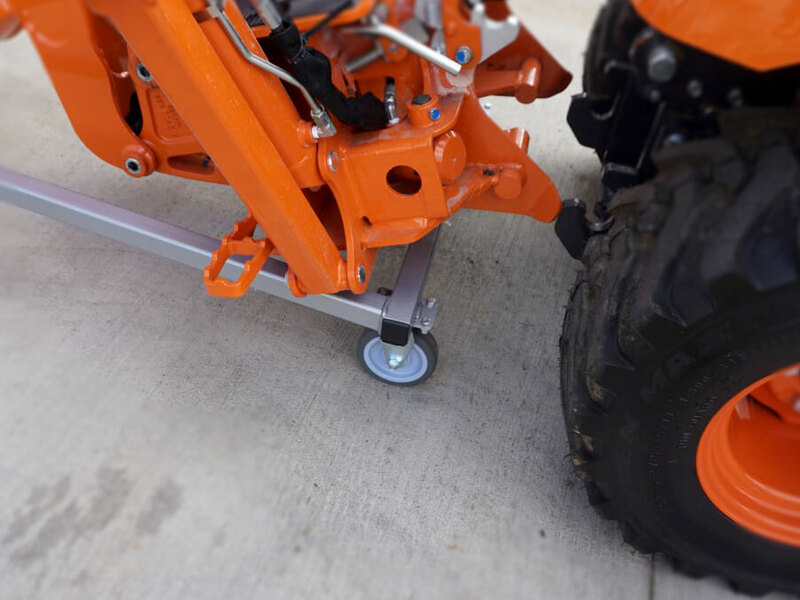 This prevents the dolly from moving sideways or making sharp turns. Solved this in my case by changing out the fixed casters for swiveling versions of the same size. Now I can turn the dolly around in its own length or roll it sideways for storage. 1st time had the backhoe off in 3 minutes and about the same time to put it back on. Before this dolly, had to play with the outriggers and positioning of tractor which took time. I was going to attempt to make one when my wife told me if you can spend almost 20k, why take the chance of damaging the tractor over $180. Smart lady. I recently purchased the dolly. I have owned my BX-25D for about 4 years. While it was fairly simple to remove the the back hoe reinstallation was always a problem because I coudn't seem to back up square to the backhoe. The dolly makes it so simple with only the one lever movement and the fact that you are pushing the backhoe into the back of the tractor. I wish I had bought this dolly when i first saw it several years ago. Keep up the good work. Now I could use one for the bush hog also. Don't waste your time with anything else. If you have a BX with a backhoe you will need one of these. Well made and so easy to use. Good product. But the casters need to be little better quality. The dolly works great. The first time I used it I had the backhoe off in no time flat. Once it was off I was able to move it around the garage to make room for the Loader, also on a dolly. I have the 60 MMM so having the dolly makes it easy to switch back and forth. Putting the backhoe back on was even easier. I would definately suggest getting this if you plan on taking your backhoe on and off as I do. Now I just have to wait and see how it holds up over time. Very well made and stable. Gives added functionality to the BX25 when the backhoe can be removed and stored so easily. Great product. Received the dolly last week....very sturdy and well made. After a quick look at the video and a little adjustment to account for the BX23 model tractor, we took off the backhoe with no problems at all. This dolly made it really easy to move the backhoe around for storage until we need to use it again. I would really recommend puchasing this product. This is the best!!! Well made and works like a charm. It was so easy to remove the BH from my BX24, and move it around the barn I will definitely be adding the Work Lights and FEL Dolly. Amazing design and so easy to use. Been using this for more than a year now with several on/off's. Works great, hangs easily on the wall when not in use. Strong but lightweight! Great dolly! This was my first purchase. I liked it so much I bought the forks next. Excellent quality and well thought out. My backhoe sits in front of my car in the garage. How about making a grapple now? Look forward to what you think up next. Bought this to eliminate having to walk/work around an immobile BH when not installed. The service was great, the product well made and money well spent! If you have a BX and a backhoe, you need this dolly. It's the difference between your detached hoe being immobile and sprawled out as big as it can get vs being as small as it can get and easy to move on hard surfaces. Probably approaching 100 sq ft difference in floor area. Kubota should OEM this part! Must have item for anyone who removes the backhoe and needs to move it. Makes a big difference if you have limited storage space. Received the dolly last week. Makes removal of the backhoe quick and easy. It is a must have accessory for anyone who removes their backhoe. In fact, I love it so much, I just purchased the loader dolly. Thank you Harry and the BXpanded Team!!! All I have to say is WOW! I was afraid to remove my backhoe because of the trouble I had with a past frame mounted backhoe. This cart made it so easy. I also have the front loader cart I can't wait to try. I think I want the pallet forks. It works just like in the video. Once you get it down, it doesn't take a lot longer, either. Even the first time, it only took me less than 5 minutes. Great product if you have a paved surface. I use it in my pole building and it is great for removal, storage, and reinstallation. Very nicely made. Very easy to unload the backhoe onto and move around. Well worth it.It keeps the BH as compacct as possible and allows it to be pusehed anywhere in my gagage. Originally I purchased the backhoe Dolly, I found it to be a time saver. I waited for over a year and placed an order for several more items including the loader dolly. Since I purchased this dolly, it makes it so simple to load and unload and store the Loader and Backhoe together. Wish I would have purchased this when I purchased the backhoe dolly. Used it for first time GREAT !!!! If you store your BX25D backhoe in a building, and do other things in it, this item is an absolute necessity. Allows you to move your backhoe around with ease and reduces implement space when disconnected from your tractor. This device should be a factory option when you purchase equipment it is designed for. Why didn't I get this a year ago?! I bought my BX25 in March, and I was having a hard time storing my backhoe. I had to put a cinderblock underneath it to keep it from falling all the way to the floor, and other than that, it took up a lot of space. My father in law found this dolly and they got it for me as a Christmas gift. I love it. There’s already been a couple of times when I’ve been in the garage and I pushed it around, just because I could. Super easy to use and appears to be very durable. All I can say is “WOW!!!”. What a brilliant idea! Thank you, not only for the product but for the very clear instructional video! Bought this for my Kubota BX25D based on the reviews. This thing rocks. Before when taking off the backhoe I had to use a hammer, crowbar and something to bang with. Took off my backhoe and the pins just slid out with no problem. The other that is nice is now the backhoe doesn't just sit in one spot taking up room. If you have a backhoe this is a must need. So based on the previous reviews I had read about this product I expected it to work okay but was concerned about being able to maneuver it around in my cramped space. I've had poor luck with wheeled things in the past. Boy was I wrong! The hoe came off the tractor and set in the dolly in about 30 seconds and I was able to wheel it around with minimal effort to it's ideal location out of the way. If you are waiting and hesitating to get one of these like I was, DON"T! Reasonable price for a well designed and engineered product that works exactly as billed. This is one of those accessories that should come with the tractor. It makes putting on the backhoe easier because you can just wheel the backhoe into position. Backing up to the hoe is not hard but the alignment needs to be just right. With the cart you can just wheel it into the perfect positon. The cart also saves a lot of space in the shed. The outriggers stay up and the boom is fairly compact. With the wheels on the cart you can now store you backhoe out of the way and push it up against the wall or in the corner. I ordered the cart right about the time the BX23S had been released. The cart I received didn't seem to fit the backhoe very well and I struggled trying to get the backhoe on and off the cart. I actually avoided using the backhoe because it was difficult to take on and off. When I contacted BXpanded a year later they confirmed my suspicion that the cart I had was not for the BT603. Without hessitation they shipped me a replacement frame. So far I have had the backhoe on and off more in the last three weeks then I did all of last year. I can now take the backhoe off to mow and put it back on with ease. If you want to save some space in your shed and you want to make installing the backhoe a little easier than order this dolly. Just be sure you have the right cart for your model. I am awed how wonderful this product is each and every time I use it. I dreaded removal of the 'hoe, and always had more than a challenge when it came to reattachment. Now, thanks to this expertly designed dolly, it is "a piece of cake"! I generally do not recommend anything -- but this dolly is ever so wonderful -- I make the exception. Buy one -- I can assure you you'll be most happy you did!!! This thing rocks! works just like advertised! Wish I had bought it sooner! If you're on the fence about this just buy it! Works with the ripper and quick connect on as well. This dolly has been a major time saver. Makes removal and especially installing a snap! Love how compact it makes storing my backhoe in my garage. I have seen some people make their own but why? When this thing is reasonably priced and works flawlessly. A must have if you go between 3pt and backhoe often as I do. Highly recommended! The dolly is well built and assembly is straight forward. Worked perfectly for me, I was able to remove the backhoe, store on the dolly and roll into the shed for the winter to allow me to add a rear blade for snow. I expect re-attaching the backhoe will also be easier with the dolly. Very happy with the purchase. 30 seconds off/ 30 seconds back on. First time use straight out of the box. I was dumbfounded! I literally sat there staring at it saying it can’t be that easy! Must have item!! Q: Will this work with my brand new BX23S?